After retiring from the Indian Navy in 2013, Roy T James has taken up writing, thus far writing and publishing four books in addition to this one, all non-fiction. Hubpages is a website that provides a venue where people can write short articles about whatever they want. You could view it as a blog covering an almost infinite number of subjects with an infinite number of authors contributing. Okay, maybe not infinite, but a lot of both. 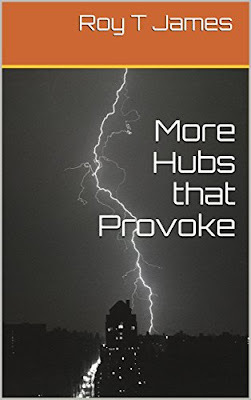 This book is a collection of 17 of the posts the author originally wrote for this site and while they cover multiple subjects, each aims to “provoke” in some way. In this context I've interpreted provoke as meaning to get the reader thinking in different ways, challenge what might be viewed as common sense or consensus opinion. Given that introduction my thoughts on these 17 articles were mixed. On the negative side I sometimes had a hard time understanding what the author was trying to say, the words not quite making sense to me. Sometimes the problem, in whole or in part, was due to missing words or grammatical errors. For example, what would you make of this sentence? On the positive side, the ultimate goal of these pieces was to provoke, whether to challenge my current thinking or look at a subject from a different perspective. Most of these pieces did that. Whether I agreed, vehemently disagreed, or my thoughts fell somewhere in the middle, I was provoked. A large number of typos, grammar problems, and other copy editing and proofreading misses for a book of this size.